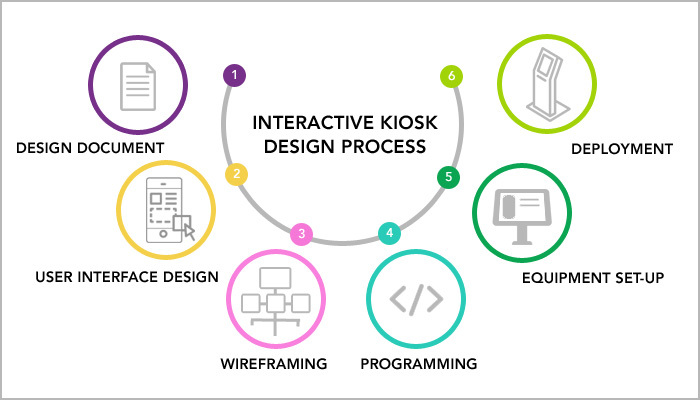 1.Design document – Kicking off the interactive kiosk design process begins with development of a design document. This document defines the interactive project’s goal, audience, strategy, scope, content outline, requirements, timeline, technical specifications, key features and analytics needs. This is the blueprint for the interactive kiosk. 2.User interface design – Utilizing corporate branding and style guides, an interactive kiosk design is developed that enables simple navigation and user enjoyment throughout the interactive kiosk. Site flow and easy access to key features are taken into consideration throughout the design process. 3.Wireframing – A wireframe is developed to work through navigation flow, button placement, interactions and page layout of the interactive kiosk. The wireframe is tested and revised until all stakeholders are confident in a streamlined user experience. 4.Programming – A beta program is developed to demonstrate and test that all key functionality is working as designed. The beta is refined until approved, then all content is added and tested, resulting in a final interactive program that is ready for final testing and then delivery. 5.Equipment set-up – All hardware is set-up, integrated and tested. Computers are put into kiosk mode, ensuring that the kiosk will run flawlessly. Installation manuals are developed and hardware is cycle tested. 6.Deployment – All interactive kiosk components are delivered. Depending on customer needs, an installation manual may be supplied or on-site installation may be preferred. Service questions are handled in an expeditious manner.